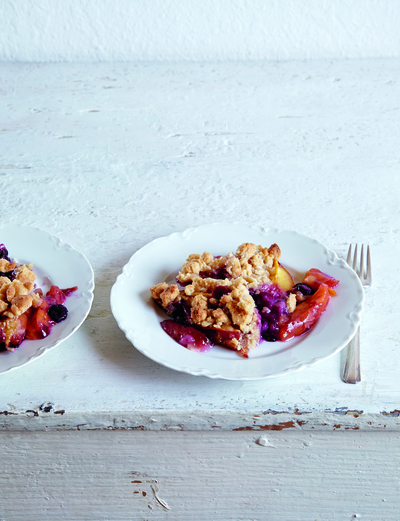 The secret to Jennifer’s juicy, bubbling baked fruit success is to use ripe peaches. If yours are too firm, add 1⁄4 cup water to the fruit mix before putting the mixture in the baking dish. Preheat the oven to 350°F and grease an 8-inch square baking dish with butter substitute. In a large bowl, mix together 1⁄4 cup of the flour, 2 tablespoons of the sugar, the vanilla, and 1⁄4 teaspoon of the salt. Stir in the lemon zest and juice and 2 tablespoons of the maple syrup. Add the peach wedges and stir to coat evenly. Gently fold in the blueberries. Spoon the mixture into the prepared baking dish. Set aside. Combine the remaining 1 cup flour, the butter substitute, the remaining 2 tablespoons maple syrup, remaining 4 tablespoons sugar, remaining 1⁄2 teaspoon salt, and the cinnamon in a large bowl and mix well with your hands until the mixture forms big chunks. Crumble the mixture over the fruit. Bake until the fruit is bubbling and juicy and the crumble is lightly browned, 45 to 50 minutes. Serve warm or at room temperature.